Jellicoe Junction–an area in Portopo, the capital city of Victoria, a fictional former British colony–is home to a motley cast, and is the wildly appealing setting of One Flew over the Banyan Tree. 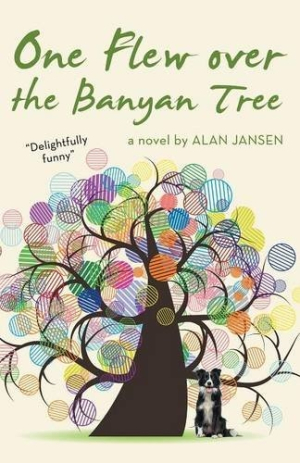 Alan Jansen’s first novel takes a ribald, florid approach in descriptions of the island, capturing its residents’ sense of mischief and loyalty. Other characters include regulars at the Nameless restaurant, family, and an out-of-place, anthropomorphized canine. Together they form a varied portrait of a working-class neighborhood driven as much by religion and routine as the need to cut loose. The contrast between the book’s elevated language and the everyday material is a splendid mash-up of mock-seriousness and humor. On several occasions, repetitions slow the pace. These include mentions of Rohan’s father, who is guilty of “alleged financial wrongdoing…at his place of employment” on one page and “an alleged financial swindle…at his place of work” a few pages later; passages that describe the same event, such as Rohan’s morning breakfast errands; phrases that describe traits—such as an aunt’s horse-like features—more than once; and other minor details. Larger-scale repetitions that hinder the work include bawdy scenes of a similar nature that lose their impact each time they recur, particularly when it comes to Baking Jane, owner of a cottage industry; Aunt Daisy, whose habitual indiscretions become a running gag; and Meena, an adolescent neighbor employed for voyeurism. Such moments denigrate the females in the town, and distract from the underpinning narrative of the plight of Rohan’s family. The novel is at its finest when it turns toward the Rohan, whose perspective combines naïveté and streetwise perceptiveness. The largely self-contained, episodic chapters are held together by the preteen’s wanderings, which place him in different social spheres and allow an expansive view of Jellicoe Junction to emerge. One Flew over the Banyan Tree is rich with meticulous detail and digression, and the payoff for the many escapades is worth the wait. The talent displayed in drawing the eccentricities, habits, speech, and inner lives of both major and minor characters is deep. This is a satisfying, picaresque feast.